Irexit: Ireland may have to consider leaving the EU. Since the Brexit vote this summer most national and international media outlets were focused on the American presidential election. However, one story that got lost in the Trump firestorm was the fact that it increasing looks like the Irish government will have to seriously contemplate leaving the EU should the terms of the British Brexit “divorce” be hard rather than soft. England is Ireland’s main trading partner and the main reason Ireland joined the Common Market (EU) in 1970 was because;” were the English market went Irish producers had to follow”. The prospect of Britain now leaving the EU within the next two year has put the Irish political establishment into an absolute tail spin. The matter is so serious that Enda Kenny, the Irish Premier, post Brexit, went directly to Germany to plead for a “special case” for Ireland in the negotiations. Angela Merkel was having none of it. Since this political failure matters have quickly deteriorated for Irish politicians and economic strategists. Last Tuesday, December 6th, the head of EU Brexit negotiations Michel Barnier stated that there would be no “cherry picking” in the terms of England’s exit and he reiterated that negotiations would be swift and blunt. This statement was greeted with dismay in Dublin. The political mood has darkened to such a degree that Ruiri Quinn, a former Irish Government Minister stated that; “the Brexit issue has become the greatest crisis facing the Irish people since World War II”. The reason for Mr. Quinn’s pejorative view is that in addition to pushing for a harsh Brexit treaty the European Commission is also moving to quickly abolish Ireland’s favorable 12.5% corporate tax rate. It is this favorable tax regime that has supported Ireland’s success in attracting a disproportionate amount of American Foreign Investment over the last 20 years or so. Without this “hook” the future ongoing development of Ireland’s export manufacturing base looks bleak. Thus the poor Irish citizen is receiving bad news on all fronts and therefore I would not be too surprised that, should it prove to be necessary for economic survival, within the next two years the Irish elite will put their media machine in motion and “motivate” Irish public opinion to support an early Irexit referendum. Market Technicals: A Radical Market Price “Re-Set” Is In Motion. Before the American presidential election last November, while the Dow Industrials were reaching new all-time highs the same could not be said for the Dow Transports. From July 2016, for four months, the Trannies languished in a trading range that was well off all-time highs. 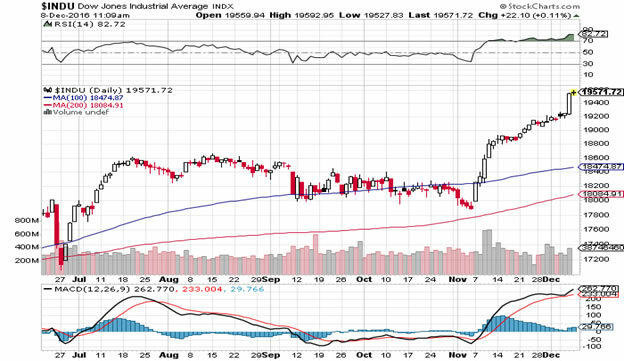 In Dow Theory parlance this indicated that there was divergence within the Dow Theory indices, indicating rising market risk and developing technical weakness. However, what a difference an election makes. 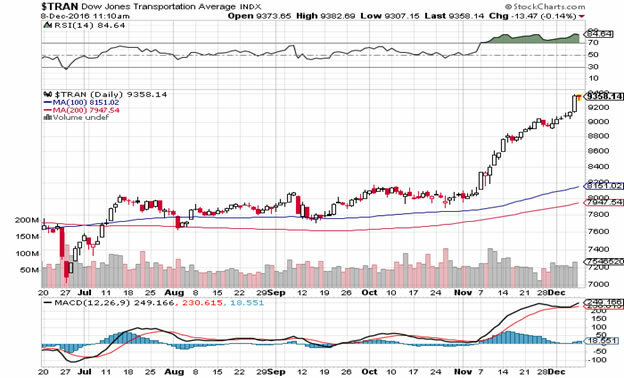 In 25 business days the Transports have quickly made up for their lost faith and have breached all-time highs with the Dow Industrials in full momentum agreement. This is a market that is now in full renewed bull mode. This fantastic momentum is obviously being powered by a price “re-set”, a modality still recalibrating the price-earnings effect of: increased American infrastructural investment, repatriated corporate taxes, de-regulated banking, empowered trade re-negotiations, freed American energy resources, significantly lower corporate tax rates, higher waged jobs, Federal government regulation shrinkage and accelerated military redevelopment. Clearly the price re-set process has a long way to go given the current momentum prevalent in market price action, future interest rate rise shocks notwithstanding. Thus with a radical Trump presidency, Brexit negotiations, prospective Fed interest rate policy changes, Dutch, German and French elections and a possible French EU Exit referendum (Frexit), I think 2017 is going to be one of the greatest trading years of all time. Chart: Dow Jones Transports: 8th. December 2016: Daily.